All tracks recorded live or at the bands practice room. 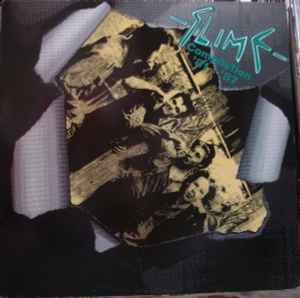 Some of this songs don't have studio quality, but give you a good impression, what "Slime" have been - a rough and aggressive playing punk band. Comes with a poster-booklet with pictures and parts of interviews, all in german. The inner sleeve shows the various line up´s of the band and links to other groups the band members played with. A1 to A4 and B1 to B3 were recorded in Berlin on 12th of September 1981. A5 and A6 were recorded at Ü-Raum. A5 in November of 1983 and A6 in November of 1986. A7 and A8 were recorded in Bingen on 26th of November 1983. B4 was recorded in Hamburg on 9th of January 1987. B5 and B6 were recorded in Hannover on 10th of April 1982. B7 was recorded in Saarbrücken on 4th of December 1082. B8 and B9 were recorded at Ü-Raum. A8 in December of 1981 and A9 in November of 1981.